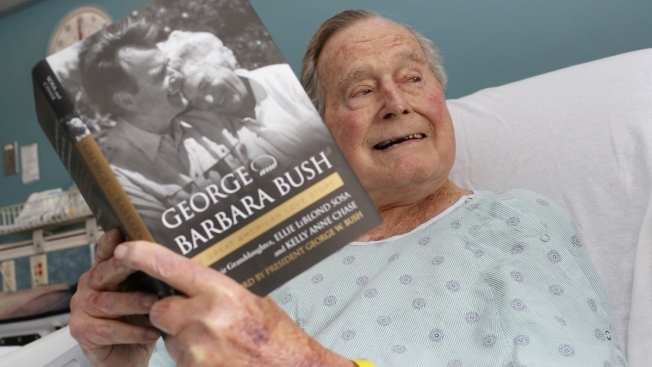 This photo tweeted on Friday, June 1, 2018, by former President George H. W. Bush shows him in his hospital bed in Biddeford, Maine, while reading a book about himself and his late wife. George H.W. Bush enjoyed a relaxing birthday on Tuesday as he became the first former U.S. president to turn 94. The nation's 41st president was receiving calls and taking it easy at his seaside home eight days after being released from a hospital where he was treated for low blood pressure, said Chief of Staff Jean Becker. Several of his children were in town, including former President George W. Bush. Another son, Neil Bush, called on people in a newspaper opinion piece to volunteer and "to become a point of light." As president, Bush encouraged others to be "points of light," reflecting his belief that people need to help out in their communities. From the Archives: Former President George H.W. 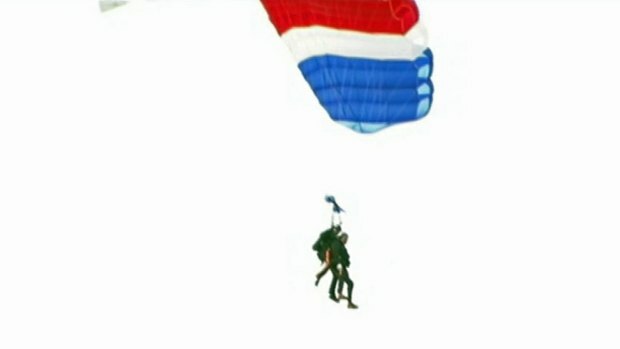 Bush celebrated his 90th birthday on June 12, 2014, by making a tandem parachute jump near his summer home in coastal Maine, delivering on a vow he made five years earlier even though he can no longer use his legs. Bush became the oldest U.S. president months ago and is the first to celebrate a 94th birthday, said spokesman Jim McGrath. Former Democratic President Jimmy Carter isn't far behind, at age 93, and he'll celebrate his 94th on Oct. 1. Two other former U.S. presidents made it to 93: deceased Republicans Ronald Reagan and Gerald Ford. The Central Intelligence Agency marked Bush's birthday by releasing declassified material related to his tenure as the agency's director from January 1976 to January 1977. The items include a video about his path to becoming CIA director and another about his farewell visit to the agency employees in January 1993, the final month of his presidency. Related to that visit is a copy of a schedule for a briefing over lunch to discuss Iraq, Bosnia, Somalia, counter-intelligence, counter-narcotics and "CIS Ops," an apparent reference to former Soviet states. After dessert, the briefs included presentations on Russia, North Korea and "Clansig Operations," an agency acronym for clandestine signals intelligence.